Space rental includes: - Light System - Sound System - Cocktail & Lounge furniture (lot of sofa seating, 10 cocktails tables, 30 bar stools, 1 lighted bar in 4 pieces & 5 low tables) - Security - Cleaning Food and beverage is not included. Seated dinner packages available by request. Rental fee doesn't include 6.7% tax. Tax would have to be added. Atmosphere/Decor: 3700 sqft, 4 restrooms, lounge sofas, 5 low tables, 10 high top cocktail tables, 30 high chairs, planters and 4 led bar counters. Special Features: SkyDeck Rooftop offers unrivaled views and an opportunity for event planners, photographers and producers to CREATE their vision, INSPIRE their client and CAPTIVATE their audience. My birthday was held at Skydeck. The space was exceptional; everyone in the party agreed that the friendly manor staff went out of their way to make my day truly special. There is a unique view over Miami Beach, which impressed everyone with its luxury, grandness, and spectacular ocean view. It is right on Lincoln Road, which made convenient for everyone. 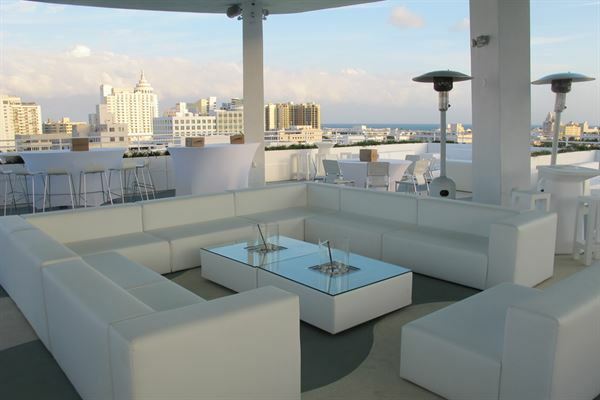 I would recommend Skydeck to anyone desiring a new and exceptional space for their party. The space is unique! The view is absolutely incredible. Miami Beach is so beautiful from up there. I celebrated my 40th birthday and everything was perfect and smoothly organized. Stephanie has been very helpful and gave me great recommendations. We had our wedding reception on Skydeck. We had a wonderful and magical time. The space is gorgeous and the view is unique. The owners were very helpful with us! Thank you! Indeed, it was a beautiful wedding. Thank you again!